*Actual data may vary in different usage environment. 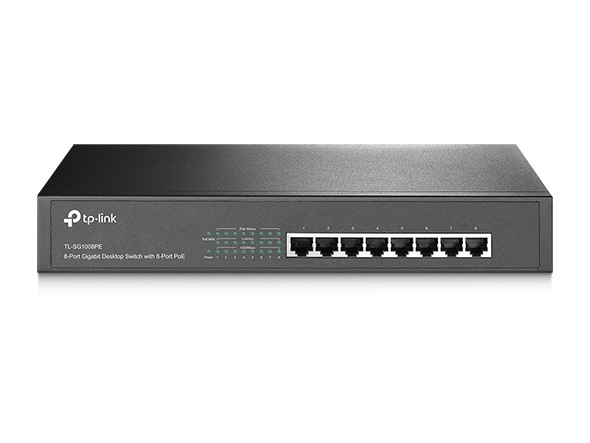 The TL-SG1008PE is an 8-Port Gigabit Desktop/Rack mountable Switch with all 8 ports supporting the PoE+ standard. 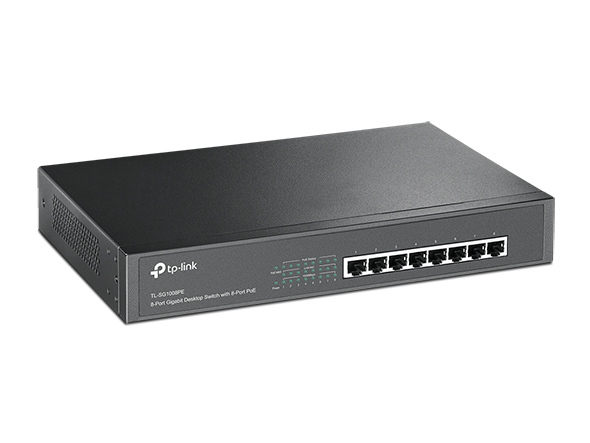 It provides a simple way to expand a wired network by transferring power and data over a single Ethernet Cable. 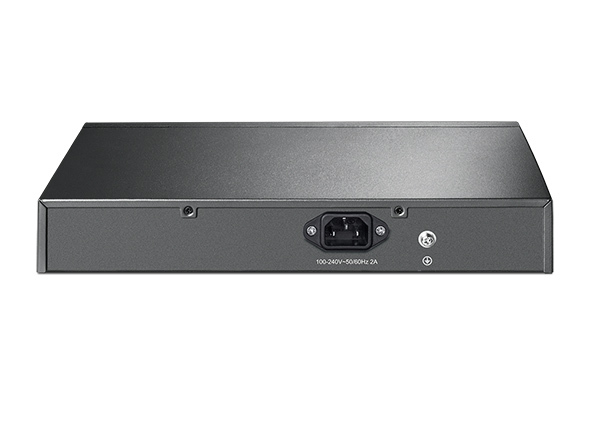 With a total power budget of 126W, up to 30W per port, TL-SG1008PE can power more high-powered devices such as wireless Access Points (APs), IP Cameras or IP Phones. Moreover, with innovative energy-efficient technology, the TL-SG1008PE can save up to 75% of the power consumption, making it an eco-friendly solution for your business network. 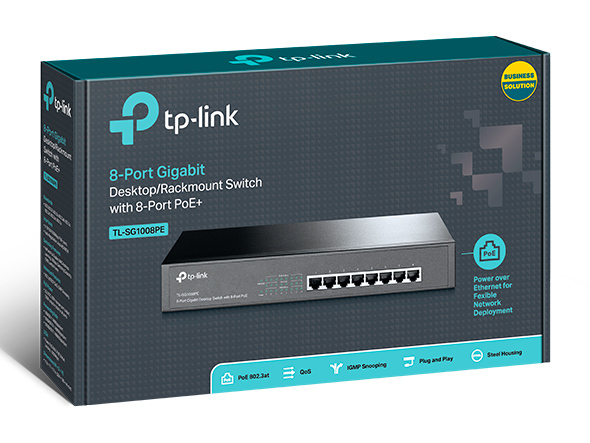 All 8 ports of TL-SG1008PE support Power over Ethernet Plus (PoE+) standard which can automatically detect and supply power to any IEEE 802.3af/at compliant device(s). In this situation, the electrical power is transmitted along with data in a single cable, allowing you to expand your network where there are no electrical cables or outlets, where you wish to fix devices such as APs, IP Cameras or IP Phones. TL-SG1008PE has a priority function which helps protect the system when its power is overloaded. If all PoE+ devices’ power consumption is greater than or equal to 126W, a priority will be arranged among the 8 PoE+ ports, at which point the system will cut off the power of the lowest-priority port. *Priority (port 1 > port 2 > port 3 > port 4 > port 5 > port 6 > port 7 > port 8): This function helps protect the system if the power becomes overloaded. For example, if port 1, 2, 4 and 7 are using 30W (maximum power per port is 30W, the system power is 126W in total), and there is an additional device inserted into Port 3 at 25W, the system will cut off the power of Port 7 in response to the power exceeding the 126W limit., This means Port 1, 2 and 4 will use 30W, and Port 3 will use 25W, with no power will be supplied to Port 7 as it has the lowest designated priority among the ports in use. TL-SG1008PE received a Recommended award from PC Pro.